Two men were arrested just days before the first round of France’s presidential election. Police officers outside an address in Marseille. POLICE ARRESTED TWO men in Marseille today on suspicion of planning an attack, just days before the first round of France’s presidential election, with bomb-making materials and guns found in searches. The foiled plot sparked fears that the closing days of the campaign could be a target for extremists ahead of Sunday’s vote, the country’s most unpredictable election in decades. A prosecutor told AFP that 3kg of explosives, guns and an IS flag were found during their search. 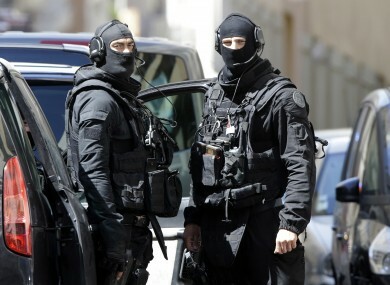 Elite police and agents from France’s domestic intelligence agency detained the two Frenchmen – identified only as 23-year-old Clement B. and Mahiedine M., 29 – in the Mediterranean port city and Interior Minister Matthias Fekl said they were known to be “radicalised”. “They were aiming to commit in the very short-term, in other words in the next few days, an attack on French soil,” Fekl said. Police found guns and bomb-making materials in searches across Marseille. Later in the day, soldiers and police were still sealing off a road where one of the men was arrested. Officials gave no indication of who the men had been targeting, but the campaign team of far-right candidate Marine Le Pen linked the arrests to her planned campaign visit to the city tomorrow. “The fact that the two individuals were arrested in Marseille as Marine Le Pen was preparing to hold a meeting the following day is perhaps not a coincidence,” a member of her entourage said. Photos of the two suspects in the plot were distributed last week to the security teams for Le Pen and centrist candidate Emmanuel Macron. Conservative candidate Francois Fillon was also warned about the danger last week, an aide said. France remains under a state of emergency after being a frequent target of terror attacks by jihadists that have killed more than 230 people since January 2015. In the deadliest attack, Islamic State gunmen and suicide bombers slaughtered 130 people in Paris in November 2015. Candidates have been heavily guarded during the election campaign, but so far there have been few security scares. On the campaign trail, the race was narrowing ahead of Sunday’s vote, with the pack closing behind frontrunners Macron and Le Pen. For weeks, centrist former banker Macron and National Front (FN) leader Le Pen have been out in front but opinion polls now show any of the four leading candidates could reach the second-round run-off on 7 May. Scandal-plagued Fillon and far-left firebrand Jean-Luc Melenchon have closed the gap dramatically in the last two weeks. “We have never seen a four-way contest like this in the first round of a presidential election,” Frederic Dabi of the Ifop polling institute told AFP. Macron and Le Pen are tied on 22-23%, with Fillon improving to around 21% and Melenchon surging as high as 20% in some polls. With Le Pen expected to reach the second round, polls continue to indicate that whoever faces her will win, although after Brexit and Donald Trump’s US presidential election win, no one is taking anything for granted. Melenchon has made the most remarkable breakthrough in recent weeks with a far-left programme that includes huge public spending and a pledge to renegotiate all European Union treaties. Email “Guns, an IS flag and 3kg of explosives found as French police foil terror plot”. Feedback on “Guns, an IS flag and 3kg of explosives found as French police foil terror plot”.